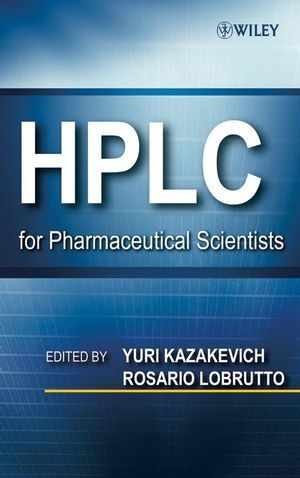 HPLC for Pharmaceutical Scientists is an excellent book for both novice and experienced pharmaceutical chemists who regularly use HPLC as an analytical tool to solve challenging problems in the pharmaceutical industry. It provides a unified approach to HPLC with an equal and balanced treatment of the theory and practice of HPLC in the pharmaceutical industry. In-depth discussion of retention processes, modern HPLC separation theory, properties of stationary phases and columns are well blended with the practical aspects of fast and effective method development and method validation. Practical and pragmatic approaches and actual examples of effective development of selective and rugged HPLC methods from a physico-chemical point of view are provided. This book elucidates the role of HPLC throughout the entire drug development process from drug candidate inception to marketed drug product and gives detailed specifics of HPLC application in each stage of drug development. The latest advancements and trends in hyphenated and specialized HPLC techniques (LC-MS, LC-NMR, Preparative HPLC, High temperature HPLC, high pressure liquid chromatography) are also discussed. Dr. YURI KAZAKEVICH is an Associate Professor of Analytical Chemistry at Seton Hall University with thirty years of experience in liquid chromatography. He has over fifteen years of academic research experience in Russia and fifteen years of research, teaching and consulting for major American pharmaceutical companies, which has resulted in numerous papers and four book chapters. The main focus of Dr. Kazakevich's research is in HPLC retention mechanisms and the description of the analyte migration through the column with an emphasis on the influence of adsorbent geometry and surface chemistry. Dr. Kazakevich is the author of Basic Liquid Chromatography, one of the oldest and most complete online instructional resources on HPLC. Dr. ROSARIO LOBRUTTO has over thirteen years of experience in the pharmaceutical industry working both with drug substances and drug products. He is a Group Head in the Pharmaceutical and Analytical Development Department at Novartis Pharmaceuticals Corporation managing multiple early to late phase projects for both small drug molecules and proteins/peptides and is responsible for teaching in-house HPLC method development training. Dr. LoBrutto is the author of twenty research articles, fifty presentations, and five book chapters in different areas of analytical/physical chemistry and has served as an adjunct professor for seven years. Dr. LoBrutto's main research directions include HPLC retention mechanisms, the influence of mobile phase modifiers on analyte retention and chromatographic figures of merit, and method development strategies for small molecules and proteins/peptides. PART I HPLC THEORY AND PRACTICE. 1 Introduction (Yuri Kazakevich and Rosario LoBrutto). 1.1 Chromatography in the Pharmaceutical World. 1.4 History of Discovery and Early Development (1903-1933). 1.7 HPLC Descriptors (Vr, k, N, etc.). 2 HPLC Theory (Yuri Kazakevich). 2.7 General Column Mass Balance. 2.10 Total and Excess Adsorption. 2.11 Mass Balance in Adsorption Model. 2.12 Adsorption of the Eluent Components. 2.18 Types of Analyte Interactions with the Stationary Phase. 3 Stationary Phases (Yuri Kazakevich and Rosario LoBrutto). 3.2 Type of Packing Material (Porous, Nonporous, Monolithic). 3.3 Base Material (Silica, Zirconia, Alumina, Polymers). 3.6 Surface of Chemically Modified Material. 3.8 Stationary Phases for Chiral Separations. 4 Reversed-Phase HPLC (Rosario LoBrutto and Yuri Kazakevich). 4.2 Retention in Reversed-Phase HPLC. 4.3 Stationary Phases for RPLC. 4.4 Mobile Phases for RPLC. 4.5 pH Effect on HPLC Separations. 4.6 Effect of Organic Eluent Composition on Analyte Ionization. 4.7 Synergistic Effect of pH, Organic Eluent, and Temperature on Ionizable Analyte Retention and Selectivity. 4.8 Examples of Applying pH Shift and Analyte pKa Shift Rules. 4.9 Effect of Temperature on Analyte Ionization. 5 Normal-Phase HPLC (Yong Liu and Anant Vailaya). 5.2 Theory of Retention in Normal-Phase Chromatography. 5.3 Effect of Mobile Phase on Retention. 6 Size-Exclusion Chromatography (Yuri Kazakevich and Rosario LoBrutto). 6.1 Separation of the Analyte Molecules by Their Size. 6.2 Molecular Size and Molecular Weight. 6.10 Solving Mass Balance Issues. 7 LC/MS: Theory, Instrumentation, and Applications to Small Molecules (Guodong Chen, Li-Kang Zhang, and Birendra N. Pramanik). 7.2 Ionization Methods and LC/MS Interfaces. 7.4 Role of Instrumental Parameters on Ionization Efficiency in LC/MS. 7.5 Effect of Mobile-Phase Composition on Ionization Efficiency in LC/MS. 8 Method Development (Rosario LoBrutto). 8.6 Effect of pH on UV Absorbance. 8.7 Analyte pKa—From an Analytical Chemist’s Perspective. 8.8 Reversed-Phase Versus Normal-Phase Separations. 8.10 Column Testing (Stability and Selectivity). 9 Method Validation (Rosario LoBrutto and Tarun Patel). 9.4 Assignment of Validation Parameters. 9.5 Distinguishing Drug-Related and Non-Drug-Related Degradation Products. 10 Computer-Assisted HPLC and Knowledge Management (Yuri Kazakevich, Michael McBrien, and Rosario LoBrutto). 10.2 Prediction of Retention and Simulation of Profiles. 10.3 Optimization of HPLC Methods. PART II HPLC IN THE PHARMACEUTICAL INDUSTRY. 11 The Expanding Role of HPLC in Drug Discovery (Daniel B. Kassel). 11.2 Applications of HPLC/MS for Protein Identification and Characterization. 11.3 Applications of HPLC/MS/MS in Support of Protein Chemistry. 11.4 Applications of HPLC/MS/MS in Support of Assay Development and Screening. 11.5 Sources of Compounds for Biological Screening. 11.6 HPLC/MS Analysis to Support Compound Characterization. 11.10 Fast Serial ADME Analyses Incorporating LC-MS and LC-MS/MS. 11.11 Parallel Approaches to Speeding ADME Analyses. 11.12 Automated “Intelligent” Metabolic Stability and Metabolite ID. 12 Role of HPLC in Preformulation (Irina Kazakevich). 12.2 Initial Physicochemical Characterization (Discovery Support). 12.6 Preformulation Late Stage (Development Support). 13 The Role of Liquid Chromatography–Mass Spectrometry in Pharmacokinetics and Drug Metabolism (Ray Bakhtiar, Tapan K. Majumdar, and Francis L. S. Tse). 13.4 Sample Preparation Using an Off-Line Approach. 13.6 Sample Processing Using an On-Line Approach. 13.7 Matrix Effect and Ion Suppression. 13.8 Regulatory Requirements for LC/MS Method Validation. 13.9 Ritalin®: An Application of Enantioselective LC-MS/MS. 14 Role of HPLC in Process Development (Richard Thompson and Rosario LoBrutto). 14.1 Responsibilities of the Analytical Chemist During Process Development. 14.8 Establishment of HPLC Selectivity by Stress Studies. 15 Role of HPLC During Formulation Development (Tarun S. Patel and Rosario LoBrutto). 15.2 Prerequisite for Analytical Chemists During Formulation Development. 15.3 Properties of Drug Substance. 15.5 Impact of Excipients on Degradation of API(s). 15.6 Test Methods for Most Common Dosage Forms in which HPLC Is the Primary Technique. 15.8 Compatibility of Excipients with API(s) (Type and Ratio). 15.10 Summary of Assay and Related Substances. 15.11 Uniformity of Dosage Units. 15.20 Implementation of Alternative Technologies. 15.21 Challenges and Future Trends. A15.1 Addendum (Common Functional Groups). 16 The Role of HPLC in Technical Transfer and Manufacturing (Joseph Etse). 16.2 Prerequisites for Transfer of HPLC Methods. 16.3 Types of Technical Transfer. 16.4 Different Approaches for Technical Transfer and Manufacturing. 16.5 Potential Pitfalls During Technical Transfer and Manufacturing. PART III HYPHENATED TECHNIQUES AND SPECIALIZED HPLC SEPARATIONS. 17 Development of Fast HPLC Methods (Anton D. Jerkovich and Richard V. Vivilecchia). 17.6 Optimizing Gradient Separations for Speed. 17.7 Instrumental Requirements for Operating High-Efficiency Columns. 18 Temperature as a Variable in Pharmaceutical Applications (Roger M. Smith). 18.1 The Influence of Temperature on Chromatography. 18.2 Effects on Method Transferability and Reproducibility. 18.3 Elevated Temperature and Pharmaceutical Separations. 19 LC/MS Analysis of Proteins and Peptides in Drug Discovery (Guodong Chen, Yan-Hui Liu, and Birendra N. Pramanik). 19.2 General Strategies for Analysis of Proteins/Peptides. 19.3 Applications for Biotechnology Products and Drug Targets. 20 LC-NMR Overview and Pharmaceutical Applications (Maria Victoria Silva Elipe). 20.2 Historical Background of NMR. 20.4 LC-MS-NMR (or LC-NMR-MS or LC-NMR/MS). 21 Trends in Preparative HPLC (Ernst Kuesters). 21.2 Method Development in Preparative HPLC. 21.3 Columns and Stationary Phases. 21.4 Choice of Preparative LC Technology. 22 Chiral Separations (Nelu Grinberg, Thomas Burakowski, and Apryll M. Stalcup). 22.2 Separation of Enantiomers Through the Formation of Diastereomers. 22.4 Mixed Types of Interaction. 22.7 Method Development for Chiral Separation. CHEMICAL AND DRUG COMPOUND INDEX.